Additional Notes: This rifle was a custom ordered rifle and has some additional features not found on a standard Gladius or Crusader rifle. 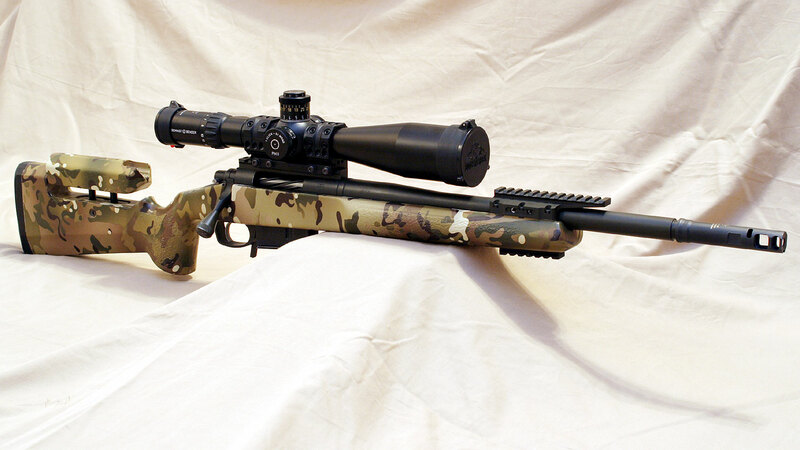 GA Precision (GAP) is perhaps the largest name in the custom tactical rifle business. They have an excellent reputation and build a large number of different rifles, everything from a hunting rifle to a M40A5 replica, and of course full custom built rifles. GA Precision made a huge news when they were able to secure the contract for the FBI HRT sniper rifles, which had to go through a very rigorous testing process. They still provide those rifles and continue to add new options and offerings to their lineup to stay on top of the tactical rifle trends. 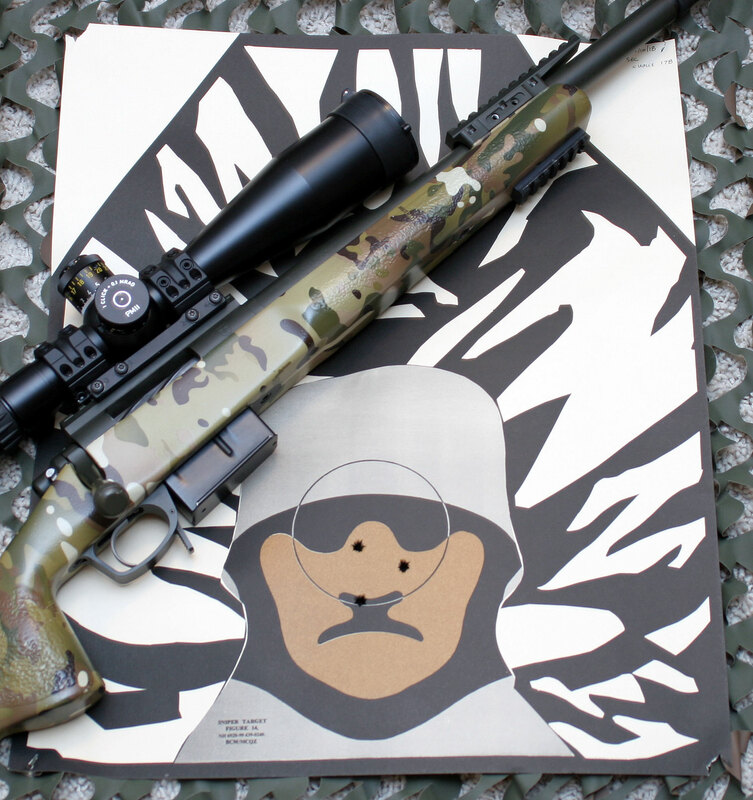 The rifle we have here for a full review is a rifle that started off as a standard rifle, but then had several options added to the build for a little custom twist. That is the beauty of ordering a custom build. As it currently sits, the rifle is closest to a GA Precision Gladius with the Templar action upgrade. 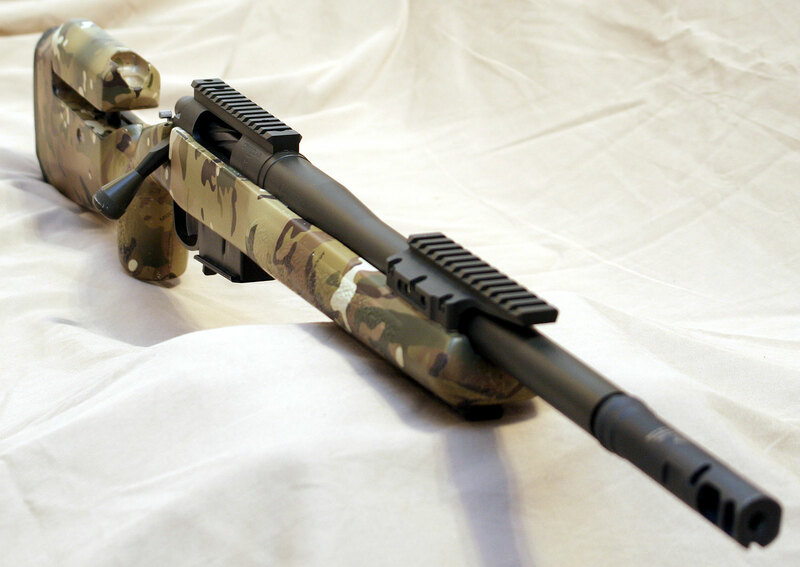 The Gladuis comes with a Manners T-2A stock that has been hydrodipped in a Multi-Cam finish. The Manners stock has a 1″ Pachmyer Decelerator recoil pad to help absorb recoil. The Manners stocks all have the more squared off shape to the buttstock which has become a Manners trade mark and you can see it in the T-2 profile on this rifle. The ‘A’ portion of the nomenclature refers to the adjustable cheekpiece on the stock which carries that same squared off, or hexagon, shape. The cheekpiece is fairly tall and there is a large cut out in it to accommodate the removal of the bolt from the action. The height adjustment is controlled by a single Allen head screw on the side of the buttstock. Just loosen that screw and then adjust the cheekpiece to the desired height and re-tighten it. 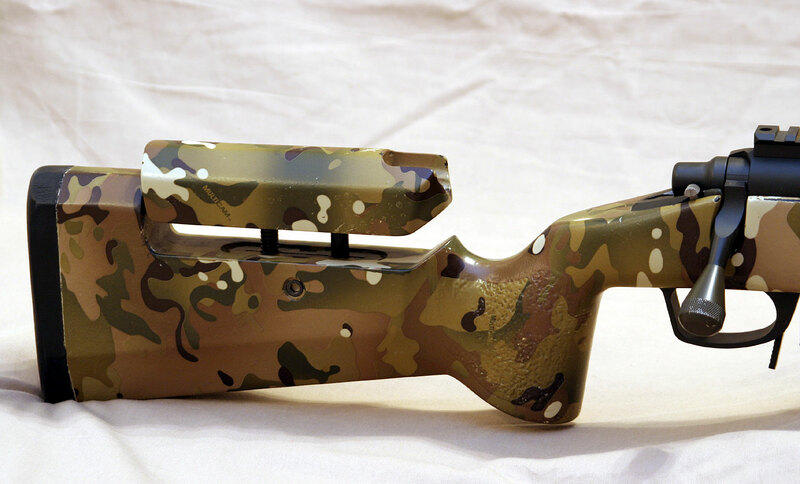 The flat sided cheekrest does provide a good resting area for your cheek, but the hydrodipping finish is more slick than a flat dull painted surface. Though it is no more slick than a straight fiberglass finish either. One area we really like on the T-2 series of stocks is the pistol grip. It is a nearly vertical style grip that has some molded in texture with a slight palm swell that provides excellent placement of your firing hand. It is plenty tall for large hands and the shape and contour is very well done. There is a reasonably deep groove behind the tang area for which your firing hand thumb can comfortably rest. That area behind the tang of the action is flat and wide and the safety on the side of the tang is easily reached with that thumb. The stock is nicely fitted to the action through the center portion of the stock before it transitions to the forearm. Those that are familiar with the excellent Badger Ordnance M5 floorplate will immediately recognize it and its operation on the Gladius. Badger Ordnance lead the way with the M5 in the developing the Remington compatible floor metal with AICS magazines. They are very well made, extremely durable, and operate great. The Magazine release extends down in front of the trigger guard and is easily operated by simply pressing the lever forward. The magazines drop free of the floorplate whether they have ammo in them or not. Yes, there are occasional accidental magazine drops as the levers can be bumped or get caught on brush or other obstacles if you are not careful. New versions of DBM floor metal are out there with buttons instead of levers to help prevent that, but it is just a matter of preference. The trigger guard itself is wide and slightly oversized for easy use with gloves. It is hard to go wrong with the M5. The standard trigger on the Gladius is a Timney set to 2.5 lbs, but the owner of this rifle replaced the Timney with a TriggerTech Primary trigger and it was set at a very smooth and extremely repeatable 1 lbs 10 ounces (1.625 lbs). We really like these triggers and it worked very well on this rifle with no takeup at all and a great break. Obviously the magazines used are the AICS mags that have become the standard used magazines on DBM setups these days. They are rugged, readily available, and work very well. 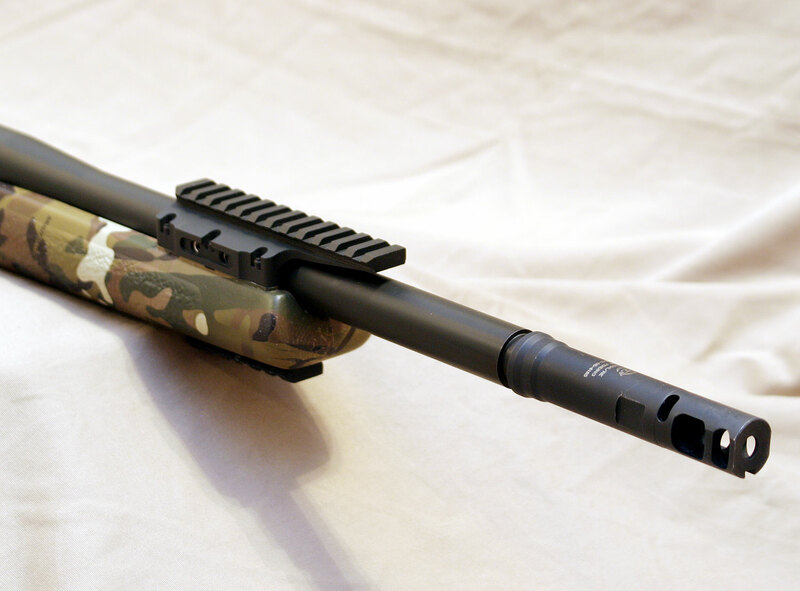 The standard Gladius rifle uses a trued Remington 700 action, but this particular rifle had been upgraded to the GAP Templar action. The Templar action is made by Defiance Machine to their very high standards. It is a “Remington Footprint” style action but has many upgrades and changes for improvement and better suitability for tactical work. The action has a closed port design for added rigidity and there is a side mount bolt release button on the left. 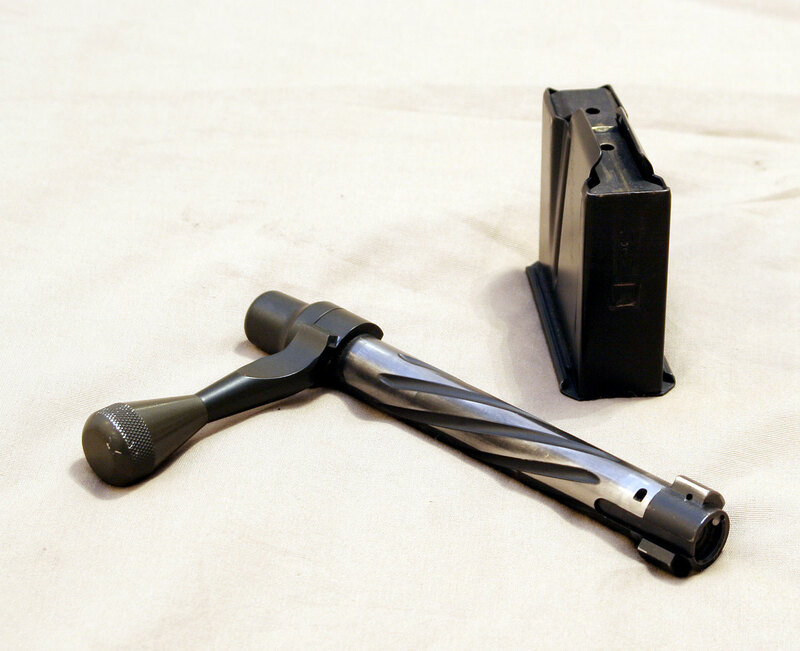 The action obviously acts and functions like every other bolt action out there, but the tolerances, machining and durability are all improved and it is extremely smooth to cycle with no bolt slop. The bolt has spiral fluting and a M-16 style extractor on it for much better extracting reliability than the Remington C-clip style extractor. Notice the fine machining of the bolt and bolt handle. The bolt still only has two lugs so the throw rotation is about the same as on a Remington. There is also a large tactical style bolt knob attached to the handle. The firing pin and firing pin spring mechanism and bolt shroud are straight from a Remington. The action comes with a very solid Badger Ordnance rail [buy here] already attached. In front of the action is a thicker and precision ground recoil lug. The forward portion of the T-2A stock houses a wide semi-beavertail forearm area that is rounded with texturing and is wide enough to house just about any barrel profile. In this particular case, GA Precision uses a GAP #6 contour Bartline stainless steel barrel that stays at 1.2″ diameter for the first 3.5″ and then steps down in a Palma like profile. The exact dimensions are unique to GA Precision, but it is a style profile popular with Palma shooters and used by some other rifle builders for their heavy barrel profiles, most notably is Remington. The barrels have a 1:10″ twist with the ever popular 5R rifling. 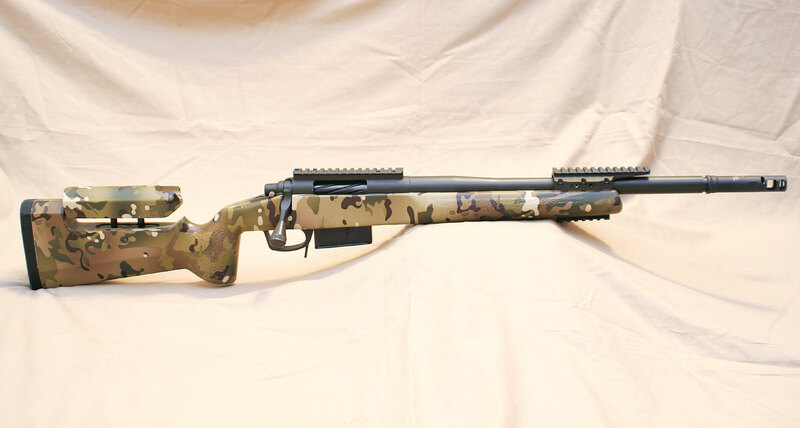 This particular rifle has a 16.5″ barrel before the 4″ long, older style, Surefire SOCOM muzzlebrake and suppressor adapter. The action and the first few inches of the barrel are pillar and glass bedded to the stock to insure the best possible accuracy. One other option that this rifle has is the Badger Ordnance Embedded Front Rail (EFR) which is used for mounting a forward mounted Universal Night Sight (UNS). These well made forward mounts bridge over and around the barrel without touching it and are glass bedded into the stock. All of the metal work is finished in a matte black Cerakote, except for the muzzlebrake which carries the Surefire finish on it. This rifle is several years old and for the most part the finish is holding up pretty well, though there is some wearing and bare metal showing in some places. 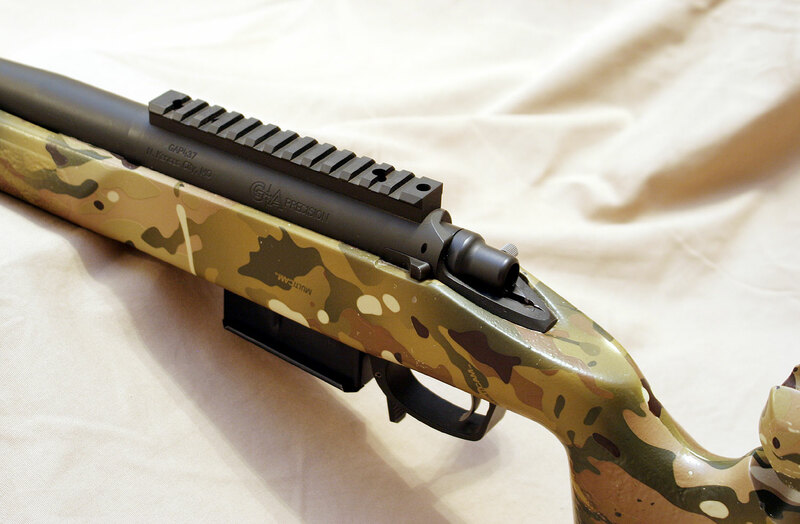 The hydrodipping on the stock is not as durable and there are several areas that are worn pretty good, but the overall appearance of the rifle is still decent and serviceable. The overall rifle is short and compact at only 40.8″ long, but it is not really any lighter than a standard tactical rifle. The reason is because the adjustable stock, heavier action, EFR and 4″ long SOCOM brake all add weight. 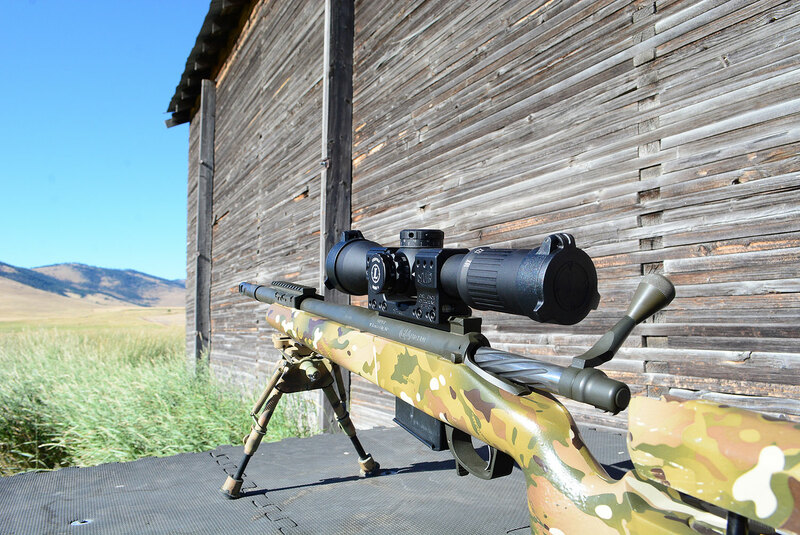 With our test scope mounted, the rifle came in at 14.6 lbs (6.64 kg), without ammo. But the shorter length and solidly built construction give the rifle a feel of stability and quality. The rifle had already been setup with a Schmidt & Bender PM II 5-25x56mm scope and so we went ahead and left it as is. The scope was mounted with an excellent SPUHR mount, which obviously made the setup and preparation for the shooting evaluation nice and easy! The scope is large and is mounted a bit high in order to properly align the scope with the UNS for night vision capability, but the adjustable cheekpiece allowed for easy eye alignment with the scope. For our shooting evaluations we opted to use three different match grade loads combined with some ball M80 ammo to get a good overall feel of the capability of the rifle. Because the barrel is a faster 1:10″ twist we did favor the heavier bullets and did not included any light weight (155gr) match ammo. 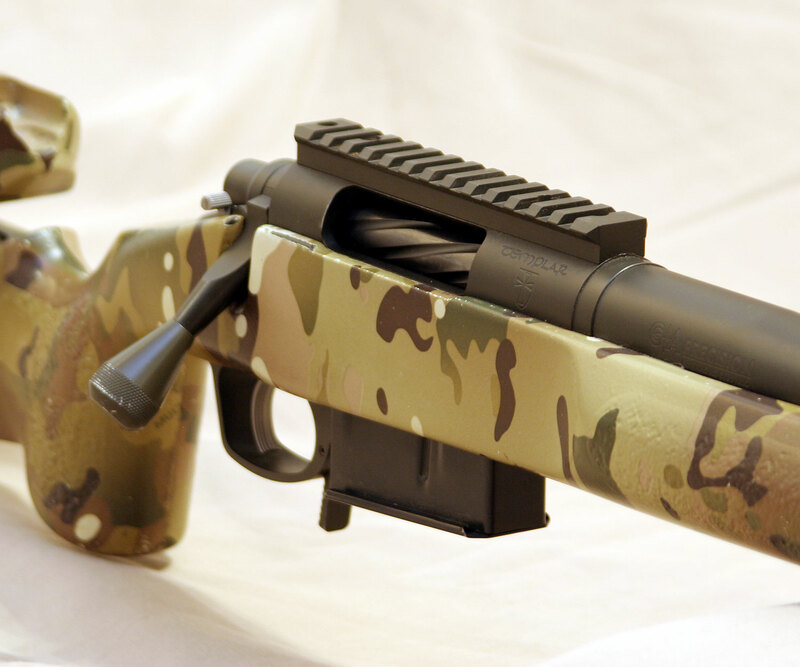 The rifle comes from GA Precision with a .5 MOA guarantee, which is common for high quality custom built rifles. For our testing we included our standard Federal Gold Medal Match 168gr load which is included on all rifle test and some Choice Ammunition 178gr SC Match and Hornady 168gr TAP. For the M80 ball ammunition we used Federal XM80C. As you might imagine, we were very surprised! We could not get the rifle to shoot any good groups down near .5 MOA. We tried everything we could and even shot other rifles to insure it was not the shooters having problems, but nothing seemed to work. We were scratching our heads and even asked the rifle owner about it, who was not with us during the tests. He indicated the same thing and that the only ammo it seems to like is Black Hills 175gr, which we did not have with us to verify. He also indicated the rifle tends to do better at longer ranges, which of course made us raise an eyebrow. The groups were all very consistent, even the M80 ball ammo shot more consistent groups than most other rifles we test. The groups were just not small. 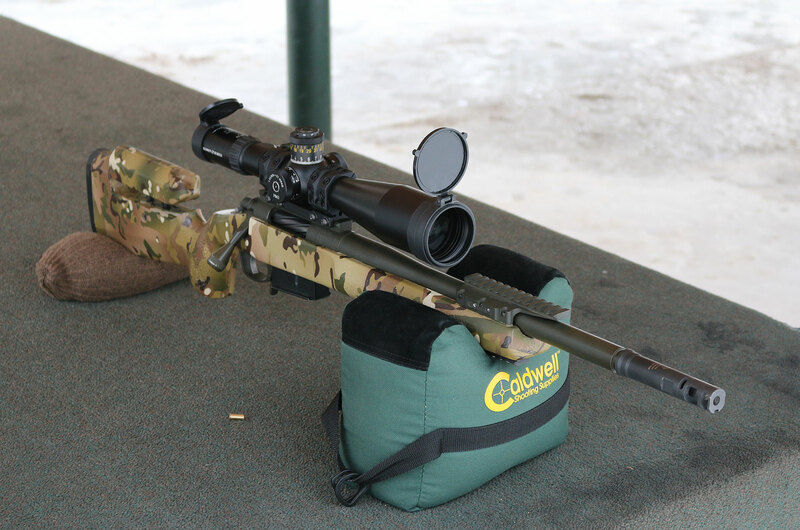 We did use the rifle at long ranges earlier with the S&B scope as well as when we tested the Leupold mk6 3-18x44mm scope and it did perform well at those ranges, though we did not do any ultimate accuracy tests during those sessions. The recoil on the Gladius is very light and extremely well controlled thanks in part to the muzzle brake and the weight of the rifle. Rapid followup shots are easy and very quick and the shooter was able to watch their own bullet impact at 300 yard targets. The rifle also feeds great from the magazine and it will even single feed with an empty magazine with no issues at all. Everything about the rifle functioned beautifully and was easy to operate. We were just disappointed in the accuracy. We evaluated our results at 100 yards and decided that the Choice 178gr performed the best and elected to use it for our 300 yard rapid fire head shot test which we performed from the prone position. Woah! Now here was the second surprise of the day after coming off of the performance at 100 yards. We figured the time would be very good because of how well the recoil was controlled, and it did not disappoint us as we matched our fastest time ever set with the M24. The real surprise was the accuracy, it was a fantastic 1.455″ (0.462 MOA) group centered right on the head. The overall score of 189.6 places the Gladius firmly in third place on our all time leaderboard. The rifle fired under .5 MOA at 300 yards under rapid fire conditions… maybe there is something to the claim of doing better at longer ranges? Either way, the rifle felt very much at home during this phase of the testing. We cannot explain why we could not get good accuracy out of the rifle at 100 yards, but we can explain that we really liked and enjoyed the rifle. The compact size of the Gladius with its weight saving barrel contour, does not translate to a light weight rifle. But the compact size does help when in the field and when a suppressor is attached. The design is well thought out and all of the selected parts and especially the build quality are top notch and excellent. A few extra pounds shaved off would be nice, better accuracy at 100 yards is expected (especially for LE use), but overall the rifle is impressive and was a joy to fire and use. Even with the accuracy where it is at, we would gladly deploy with it. your tabelle is wrong!the ball ammo is missing.instead you wrote GMM twice! Great review of a lovely rifle. More reviews please!